While most Los Angeles groups were from... well, from Los Angeles, the Squires were from the suburb of Pasadena, forming in 1954 at John Muir High School. Their idols were the Crows, the 5 Blind Boys, the Dixie Hummingbirds, and, later on, the Jacks/Cadets. Originally a quintet, the original members were: Lee Goudeau (lead tenor), Chester Pipkin (tenor and guitar), Dewey Terry (falsetto), Henry Johnson (bass), and Freeman Stevens (tenor). They began "just singing around school," according to Chester. When things got to the appearance stage, Lee's father, Thomas, acted as their manager. 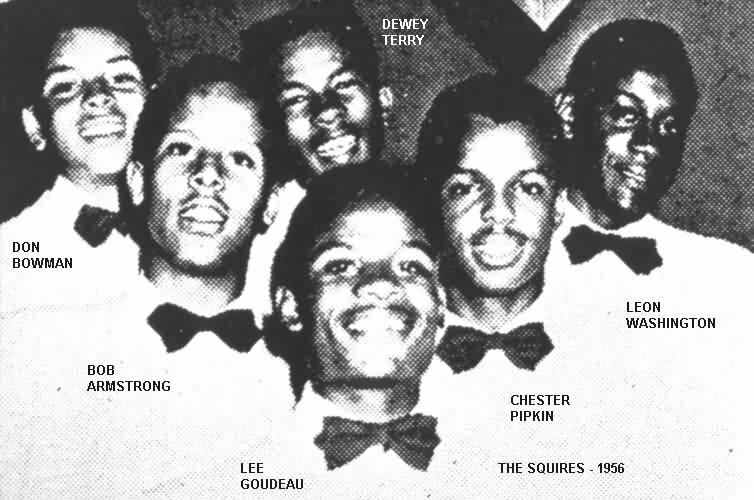 It's kind of surprising that they chose the name "Squires," since there already was a group by that name in L.A.: Delmer Wilburn's Squires that had already turned out two records for Combo (we'll hear more about them later). However, it's possible that they'd broken up by this time. Freeman Stevens didn't last too long with the Squires. When he left, he was replaced by baritone Bobby Armstrong. Then five became six when they added Don Bowman (second tenor and piano), a friend of Dewey Terry. Ned Herzstam and Gordon Wolf, who were toying with starting a record label, saw the Squires at a show and offered to record them. The result was "Lucy Lou"/"A Dream Come True," released, in October 1954, as the first record on the brand-new Kicks label. That's Lee doing the lead to "Lucy Lou"; Lee and Chester do a duet lead on "A Dream Come True." Nothing much happened with the record (nor was it even sent out for review) and, at this point, Henry Johnson left, to be replaced by bass Leon Washington. Sometime in the fall of 1954, both Dewey and Chester had gotten after-school jobs working at Perfection Plastic Products. Owned by Larry Mead, this was a low-budget record pressing plant at 1486 North Fair Oaks Avenue, right down the block from where Dewey lived. (As far as I can determine, the plant was literally in Mead's back yard.) They spent their time packaging records and delivering them to local retail record stores. Mead not only owned the pressing plant, but a couple of labels too: Mambo and Dig This Record. 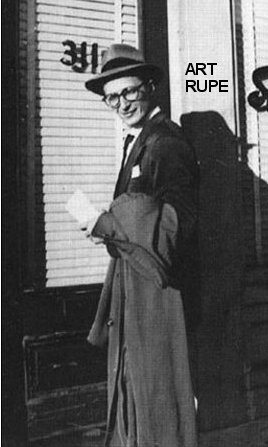 His A&R man was Mike Gradny, who would start Spry Records in 1957. With two members of the Squires working for Larry Mead, it shouldn't come as a surprise that the Squires ended up recording for him. The Squires' first recordings for Mead were on his cheapie Dig This Record label. These fell into the genre of EPs that featured four immensely popular songs covered by immensely unknown artists. They were cast as the "Blue Jays," a name that Chester thinks Mead dreamed up for them, since "Mead was directing the whole ship." They recorded a bunch of hit tunes of the day, most of which had made the national charts between November 1954 and January 1955: "Earth Angel" (led by Chester), "Sincerely" (Chester), "Hearts Of Stone" (Lee), "Pledging My Love" (Don), and "Ling Ting Tong" (Don). They also recorded some that didn't make the current national charts: "Stingy Little Thing" (Don), "Don't Drop It" (Don), "Shoo Doo Be Doo" (all, with Bobby Armstrong on the bridge) and "Every Day I Have The Blues" (Don; a Joe Williams hit from 1952). 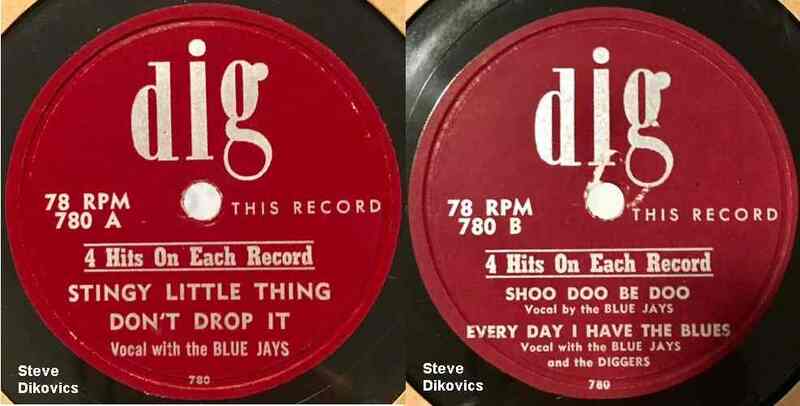 All the Dig This Record releases were from early 1955. 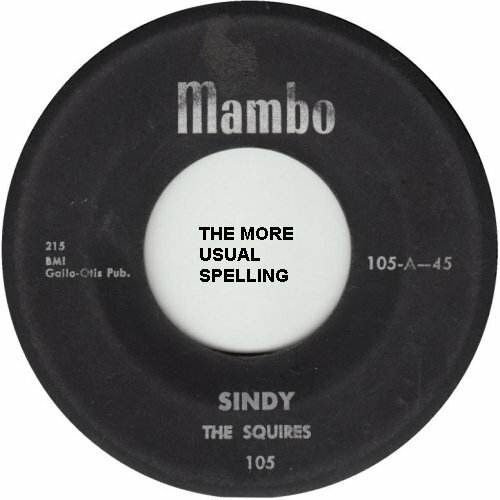 The Squires' first effort under their own name was "Sindy," led by Lee. "I wrote 'Sindy' for a girl down the street that I liked," says Chester. The flip was "Do-Be-Do-Be-Wop-Wop," fronted by Dewey. 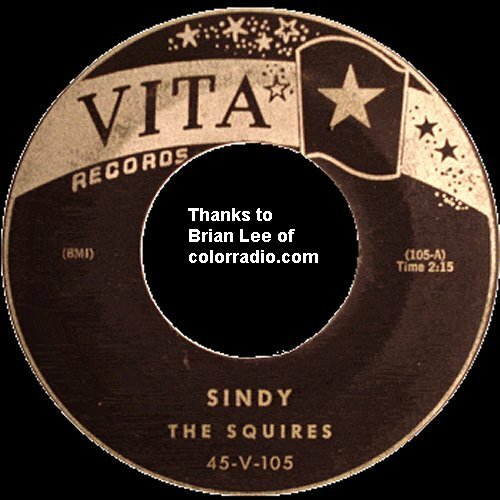 Released on Mambo in April 1955 (some copies said "Cindy"), "Sindy" was #10 on the Cash Box Los Angeles charts on May 21 and #2 on July 9. This inspired some cover versions: the Tenderfoots on Federal (pretty much the Lamplighters without Thurston Harris) in July, and the Cobras (another group from Pasadena) on Modern in August. "Sindy" did so well, in fact, that it became Al Jarvis' Command Performance recording for two weeks (Jarvis is the DJ who's actually credited with pushing it into hit status; he once played it six times in a row). However, when it was reviewed on July 9, it was only ranked "good." Other reviews that week went to the Emeralds' "It's Written In The Stars," the Harptones' "Life Is But A Dream," the Platters' "Only You," Piano Red's "Red's Boogie," the Sonics' "As I Live On," and the Griffins' "Scheming." That same day, the Squires appeared on Jarvis' TV show, Holiday Hi-Jinks. At this point, Larry Mead had second thoughts about the name of his label. 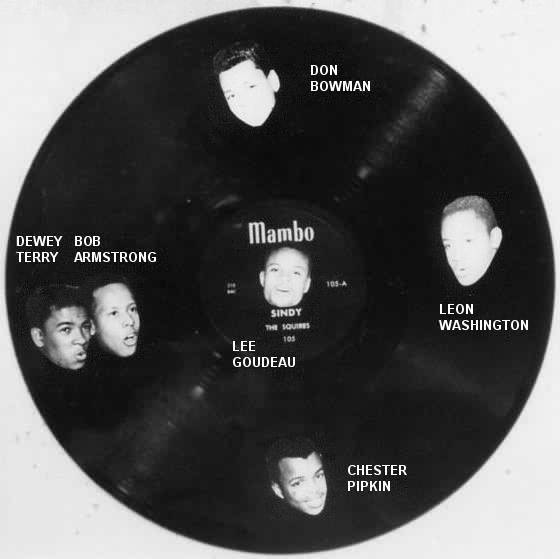 While Mambo had been named to take advantage of the mambo craze of the mid-50s, there was always the nagging suspicion that the distributors might pass it by, thinking it was a Latin music label instead of one specializing in R&B. 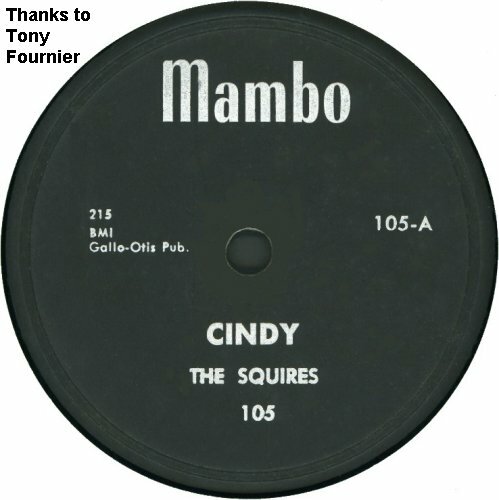 Therefore, exit "Mambo" and enter "Vita," which would be the Squires' home for their next five releases. 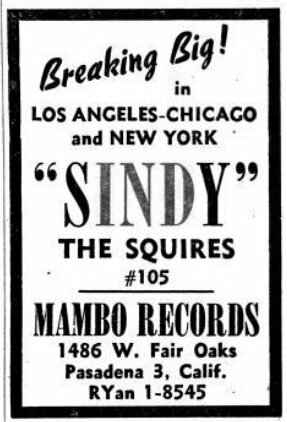 Because of the success of "Sindy," the Squires got to play Billy Berg's prestigious 5-4 Ballroom in L.A. ("We thought we'd hit the big time," says Chester.) They also appeared at the Shrine Auditorium, the Orpheum Theater, and lots and lots of dances. 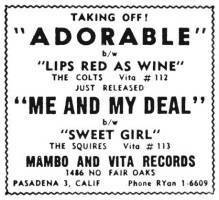 In September, Vita issued their second record: "Me And My Deal" (led by Lee), backed with "Sweet Girl" (led by Dewey). Al Jarvis wrote the lyrics to "Me And My Deal," which I had always thought was West Coast slang. However, Dewey assured me that the Squires had never heard the term either. ("We hated that song," remembers Chester.) Worse, the woman who ran the pressing equipment at Perfection Plastic Products (who was, according to Dewey, more familiar with the bottle than she was with the equipment) managed to cut the 45 master with a 78 stylus. Possibly for this reason, "Sweet Girl" was re-released in October, this time with "Heavenly Angel" (fronted by Chester) as the flip. It may also be the reason that "Me And My Deal" was never sent out for review. "Heavenly Angel" was reviewed, but only rated "fair" (as was the flip) on November 19. Other reviews that week were for the Midnighters' "Rock And Roll Wedding," the Hearts' "Until The Real Thing Comes Along," Nappy Brown's "Doodle I Love You," the Sunbeams' "Come Back Baby," Jimmy Jones & the Sparks of Rhythm's "Stars Are In The Sky," the Cadets' "If It Is Wrong," the Saigons' "You're Heavenly," Marvin & Johnny's "Will You Love Me," the Hepsters' "I Had To Let You Go," the Coronets' "Don't Deprive Me," and the Chirps' "Sixteen Tons." On October 1, the Squires appeared at the Green Mill Ballroom in Ventura, California. Then they were off on a tour of the West Coast. In November, the Squires backed Effie Smith on "Guiding Angel"/"You Ought To Be Ashamed." These tunes were reviewed on December 17, along with the 5 Pennies' "Let It Rain," Clyde McPhatter's "Seven Days," B.B. King's "Sixteen Tons," the Danderliers' "May God Be With You," the Solitaires' "Magic Rose," Hal Singer's "Hot Rod," the Charms' "Love, Love, Stick Stov," Billy Nelson & the 5 Wings' "Pack, Shack And Stack," the Scamps' "Waterproof," and the Cats' "Get Gone." In December, they appeared at Pasadena College, along with their labelmates, the Colts. The MC was KFWB DJ Zeke Manners. 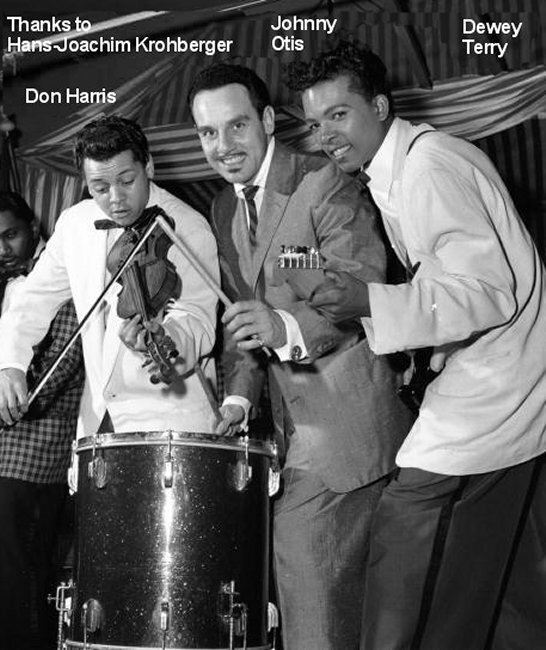 They also did a tour with Johnny Otis and appeared on some radio shows, most notably Peter Potter's Platter Parade, the Make Believe Ballroom, and Hunter Hancock's Hunting With Hunter. 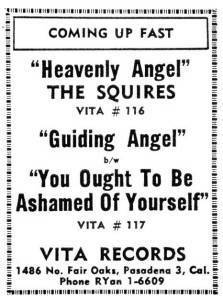 In February 1956, Vita released two other Effie Smith tunes that had the Squires in the background (but this time uncredited): "Water! Water! "/"Champagne Mind With A Soda Water Income." These were unfavorably reviewed on April 14, along with the 5 Keys' "I Dreamt I Dwelt In Heaven," the Teenagers' "I Want You To Be My Girl," the Sensations' "Please Mr. Disk Jockey," the El Dorados' "Now That You've Gone," the Pearls' "Bells Of Love," and the Keynotes' "Really Wish You Were Here." 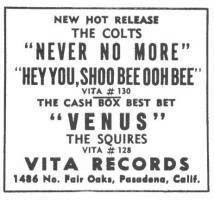 The Squires' last Vita record was "Venus" (led by Lee), coupled with "Breath Of Air" (led by Don), released in April 1956. In a way, this was a disappointment for the Squires: "We wanted this ["Venus"] to be our second release," said Chester. "It got good reaction whenever we sang it at shows." But Mead had gone with "Me And My Deal," and by the time "Venus" was released, most of the momentum was gone. Both sides were rated "good" on May 5, along with the Hurricanes' "Your Promise To Me," Little Willie John's "Fever," the Squires' "Venus," Boogaloo's "Big Fat Lie," the 5 Chances' "Gloria," the Rockers' "I'll Die In Love With You," and the 4 Jacks' "Walking And Crying." The Squires were limping along at this point. "Most of us had graduated in June," says Chester, and things were changing. By the summer of 1956, the fledgling Valiants were working on stealing Chester Pipkin away from the Squires. Valiants' member Rip Spencer said: "[The American Legion Hall in Pasadena] is where we met the Squires, which Chester was in. Chester played guitar and we kinda needed somebody to help us along at our rehearsals that could play an instrument and we recruited Chester. He was still with the Squires, but they were in the process of breaking up.... Every Sunday, for months, we would go up to Chester and he would rehearse us and eventually he would put in his voice with what we were doing and we formed the Valiants." After spending more and more time with the Valiants, Chester would finally make the break with the Squires in early 1957. The Squires rehearsed at the house of Effie Smith (whom they'd backed up on "Guiding Angel") and her husband John Criner (soon to become road manager of the Valiants and then manager of the Olympics). One day, Effie and John heard Dewey Terry and Don Bowman singing a duet and enticed them to record that way, meaning there'd only be a two-way split of any money, not a six-way. Criner had a couple of little labels (Shade and Spot), and these are where the first "Don And Dewey" recordings appeared. They were both issued in May 1956, but I'm not sure which was first. 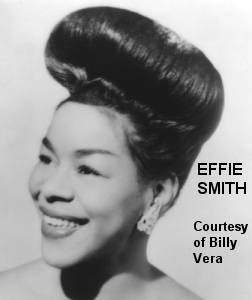 "Miss Sue" and "My Heart Is Aching" were vocals released on Shade, while "Slummin'" and "Fiddlin' The Blues" were instrumentals. 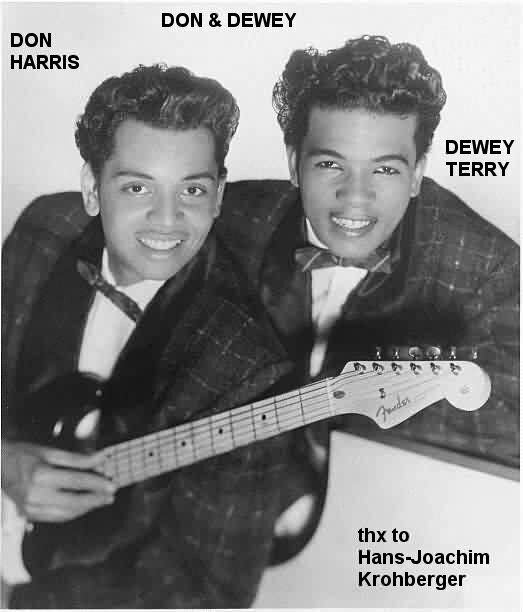 Don Harris (as Don Bowman subsequently called himself; Chester thinks that "Harris" was his real name) played the electric violin and guitar; Dewey Terry played piano and overdubbed bass. These records did poorly, mostly because Criner didn't know how to successfully market them. 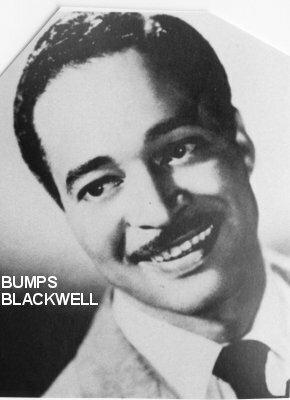 Robert "Bumps" Blackwell (an A&R man for Art Rupe's Specialty label) took Don & Dewey to Specialty, where they started off with the frenetic "Jungle Hop." 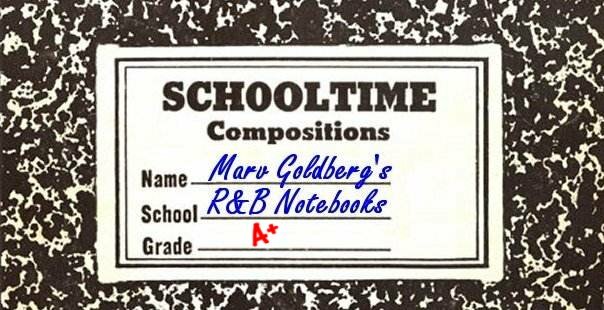 While their recordings didn't do all that well, the songs that they wrote were recorded extensively by others. "I'm Leaving It All Up To You" was a #1 Pop hit for Dale & Grace in 1963; "Farmer John" was a Top 20 hit for the Premiers in 1964 and was also done by Neil Young; "Big Boy Pete" became a smash for the Olympics; and "Justine" made the charts by the Righteous Brothers (who patterned their act after Don & Dewey). Note that "KoKo Joe" isn't the same song as the one later done by Jerry Reed. In all, there were a half-dozen singles on Specialty and two more on Fidelity (a reactivated Specialty subsidiary). Then, when Specialty A&R man, Sonny Bono left for Sid Talmadge's Rush and Highland labels, the guys went with him. This was a big mistake on their part, since Rush was too small to give them proper exposure. 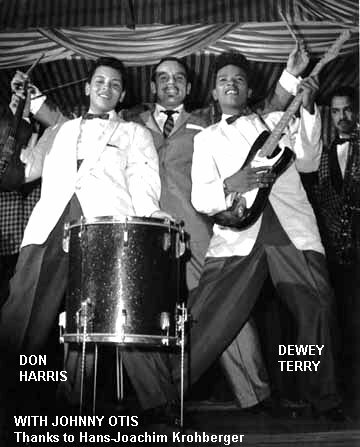 Around 1964, Don & Dewey became part of Little Richard's backup band for a while. They also put together a lounge act, playing the Dunes in Las Vegas for a few years. 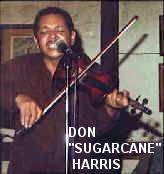 Finally, Don turned himself into blues violinist Don "Sugarcane" Harris (and played with Frank Zappa and John Mayall). Dewey, whose idol was Guitar Slim became something of a guitar legend himself. Don & Dewey continued to appear together over the years (including a European tour). Don Harris died on December 1, 1999, at age 61. 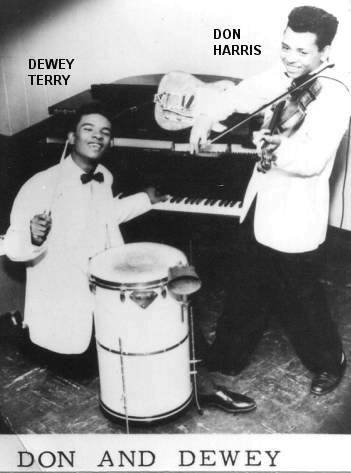 Dewey Terry kept the "Don & Dewey" name going for a while, appearing with vocalist/keyboardist Ron Shy and drummer Don Hendricks. 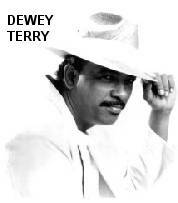 Dewey passed away on May 11, 2003 - he was 65. I've read that the Squires might have recorded as the Highlanders ("Sunday Kind Of Love"/"Beg And Steal" on Rays in October 1957), but they were actually James Manning's group that formed on an Air Force base in San Diego. Sure enough, when Chester listened to the songs, he knew it wasn't the Squires. 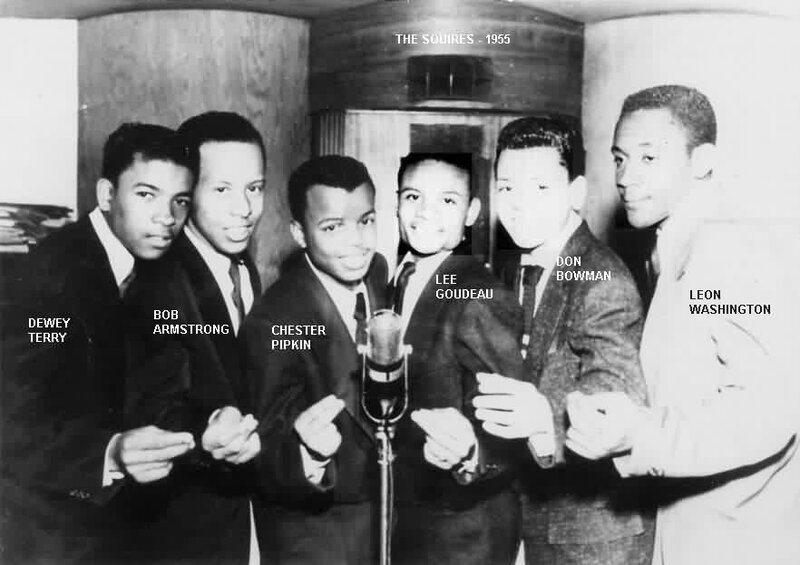 By mid-1958, the remnants of the Squires teamed up with Billy Spicer (the real name of the artist variously known as "Billy Jones," "Billy Fortune," and "Billy Storm"). They're heard (uncredited) on his Billy Storm Barbary Coast release: "The Way To My Heart"/"Angel Of Mine," issued in August. Next came "Everyword [sic] Of The Song" and "Listen To Your Heart." These tunes were originally released on Dorinda and Hite Morgan's Dice label, as by "Billy Fortune & the Squires." However, they found out about another Dice label in New York and quickly reissued the song, with the same record number, on their Deck label (which already had had a release or two by the Calvanes). This time, the artist credit went to "Billy Jones & the Squires" (although "Listen To Your Heart" only had Billy's name on the label). Whatever the credit, this is the last known gasp of the Squires. The Squires were an interesting group. Aside from giving us some pretty good music, they also gave us Don & Dewey. Remember that there was another Squires group around in 1954? They consisted of Delmer Wilburn (lead), Otis White (first tenor), Jimmy Richardson (second tenor), James Myles (baritone), and Maudice Giles (bass). They first got together in the Greenmeadows Playground in L.A., later adding Ethel Brown as a pianist and arranger, since she understood harmony. In the fall of 1953, Jess Willard, who owned a record shop, heard them practice and brought them to the attention of Vernon "Jake" Porter, owner of Combo Records. In late 1953, they recorded at least seven songs for Combo. Two of these, "Let's Give Love A Try"/"Whop," came out that year. Two others, "Oh Darling"/"My Little Girl," were issued in early 1954. There are three known unreleased tracks: "Where Are You Tonight," "I Want A Girl," and "Am I A Fool." Sometime after the recordings, James Myles left, to be replaced by baritone James Derbigney, who was a childhood friend of Ethel Brown. While Delmer Wilburn told me that Derbigney was on the second record, it's Myles' name that appears on the label, so it's possible that all the released recordings were done at one session (or, Combo just didn't change the printing dies from the first record). The group made no big appearances; only local dances and frat parties. There was a blurb in April 1954 that Dootone had signed the Squires. Whether or not it was this group, there were never any Squires records on Dootone, but there might be some unissued tracks that represent the final recordings by the Combo group. When they drifted apart, Delmer Wilburn eventually ended up in the Turks with Gaynel and Alex Hodge. Later on, he was part of Eli Price & the Manhattans on Dooto, and then the Mandels, who recorded for Lilly in 1961 [Alice Smith, Ann Cain, Pearline Bradford, and Emily Mayweather]. Maudice Giles became a member of the Hollywood Saxons. Discography courtesy of Ferdie Gonzalez. Ads are from Galen Gart's First Pressings series. Special thanks to Rip Spencer.